Events are the “actions” your users take in your application, which can be anything from clicking a certain button to landing on a specific page. They are manually set up (“tracked”) in your application and sent over to Appcues. Common uses are for things like “Invited a teammate”, “Updated account information”, “Logged in”, etc. Why send Events to Appcues? One of the powerful features of Appcues is the ability to very specifically target users based on who they are or where they are in their customer lifecycle. Tracking events allows you to surface content when a user has or has not completed certain actions or tasks that are key to becoming a successful user of your application. How do I send events? Check out the Sending Events Guide (technical) document. Which events should I send? Events are more application-specific than User Properties, so it's not as simple to provide specific recommendations. One place to start is the Strategies for a great Customer Experience section and especially the Onboarding and Education Strategies. Think about the actions you will be driving your users toward with Appcues and how you will be measuring the success of your work with Appcues and within your Application. To make it easy to figure out what events (and user properties!) you want to send to Appcues, we created an installation plan template. Click here to make a copy of the template. 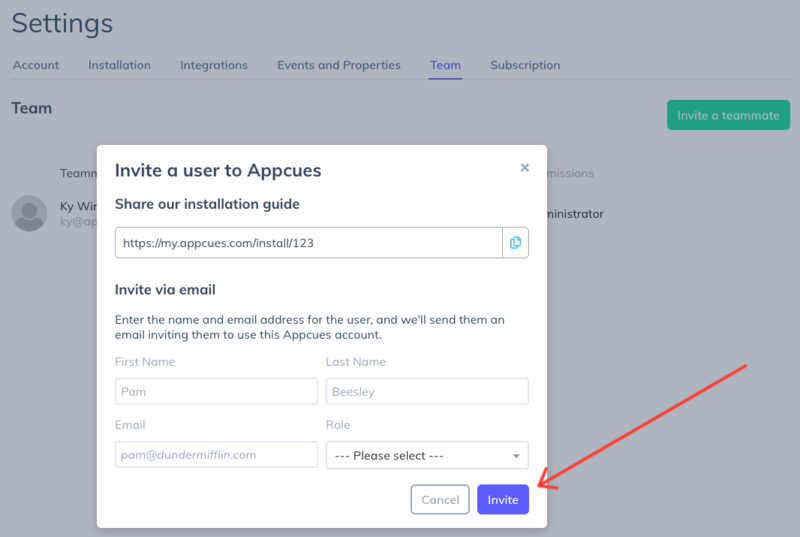 If you choose to create an installation plan, you can share it with the developer(s) that will install Appcues so they know exactly what data you need!